Todoist has an elegant way of notifying customers of new releases. In the upper right corner, notice the 1 gear icon has a red dot on it. Click the gear to see a list of choices. Click 2 New version available to update to the latest version. Click 3 Version 723 to read the 4 change log. Once you update to the latest version, the red dot disappears. The notification signal is persistent but unobtrusive. 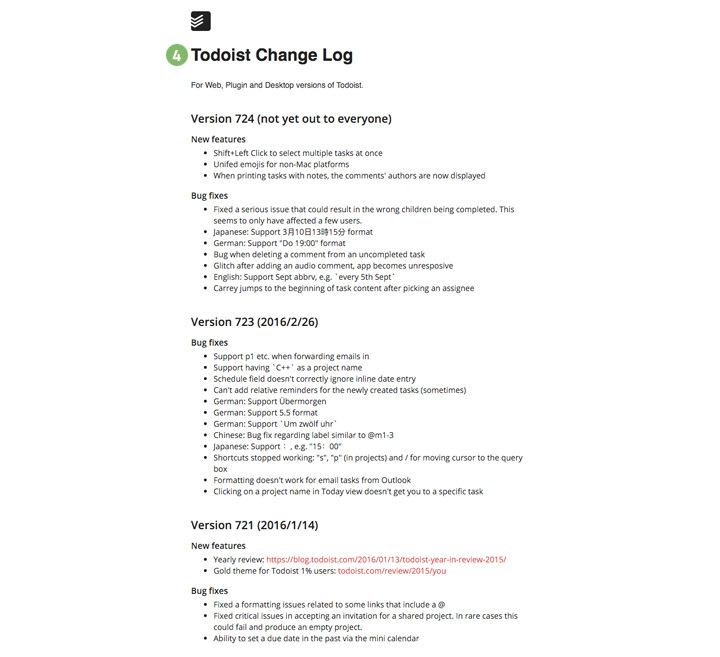 The change log is simply written and organized, making it easy to read. The change log includes bug fixes as well as new features. More robust changes (like version 721 yearly review) link to a blog article with more information. It’s transparent about staged releases (“Version 724 not yet out to everyone”).